The balcony at Akal Takht where Guru Granth Sahib has been installed. Akal Takht Jathedar Giani Gurbachan Singh has resumed the practice of installing Guru Granth Sahib in the balcony of the Takht in the morning and evening hours. 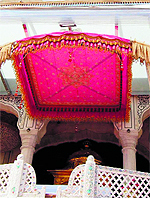 A ‘bir’ of Guru Granth Sahib is already installed inside the Akal Takht premises. Talking to The Tribune, the Jathedar said, "It is an old tradition which we have revived. Earlier, only Sikh gurus' weapons were showcased at the Takht, but later on, the Panth started the tradition of installing Guru Granth Sahib there". He said initially Guru Granth Sahib used to be installed at the balcony of the Akal Takht in the morning and evening. Even weapons of the gurus used to be exhibited from the balcony to the devotees who sat in front of the Takht. However, later it was permanently installed inside the Takht. "Now, we have resumed the old practice. At the same time, Guru Granth Sahib continues to be installed inside the Takht". He said a shed had been erected and curtains put up in the balcony to give a suitable look to the place. Former Akal Takht Jathedar Giani Joginder Singh Vedanti said the tradition of installing Guru Granth Sahib in the balcony was there during his stint. But, later they permanently installed the holy scripture inside the Takht as at times sudden rainfall or inclement weather conditions used to create a problem. He said they used to install Guru Granth Sahib at the Takht's balcony at the time of departure of "Palki Sahib" till recital of "Aasa Di Waar" in the morning and at the time of beginning of "Rehraas" up to "samapti" in the evening.